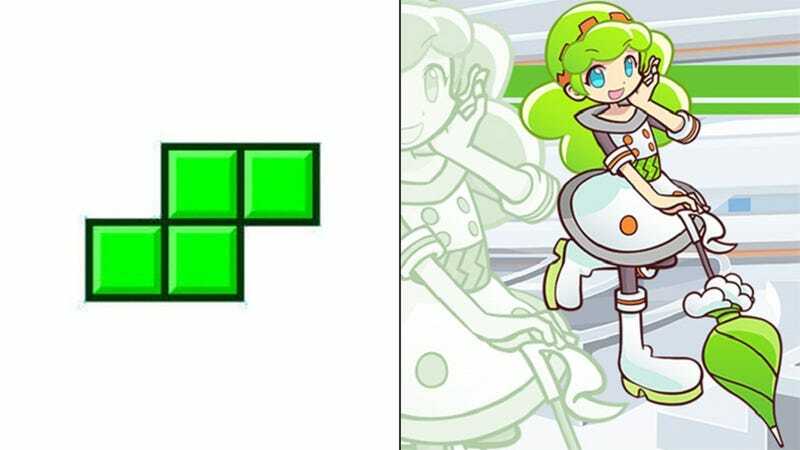 Earlier this month, Japan saw the release of Puyo Puyo Tetris, a game that mixes the two classic puzzle games. But while Puyo Puyo games have characters (and a plot), Tetris doesn’t. Thus, there was only one possible solution: Turn everyone’s favorite shape blocks into anime characters. In the plot of the game, the Tetris block characters are astronauts on a spaceship that is approaching earth and each character is named after a specific Tetris block: T, I, S, Z, O, L, and J respectively. They all share the same color motif as the shape they represent—i.e., T has plenty of purple while O is mainly yellow—and each features their corresponding Tetris block somewhere in their character design. T is the Prince of Tetris and captain of the ship. I is a tall, dog-like alien and the ships chief engineer. S is a cute-looking but selfish girl that becomes rather nice whenever Z is around. Z is a robot and the ship’s housekeeper. O is T’s constant companion and the ship’s cute mascot. L and J are a pair of inseparable twins and many people are confused which is which.